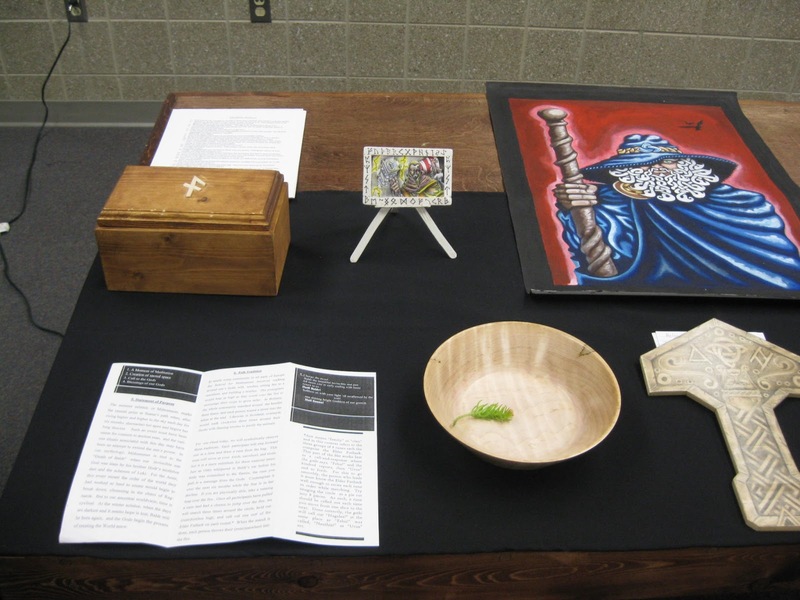 The top picture is one side of the altar; the top row is a wooden box and two paintings, both by inmates. The bottom row is a copy of the readings done in the ritual, a wooden bowl, and a wooden Thor's hammer. The next picture is the other half of the altar; top, another view of the painting of Odin, and a Sunwheel with a bag of runes in the center. The Sunwheel was made by each of them folding points from bits of paper, and then joining them all together. Top right is an oath ring. 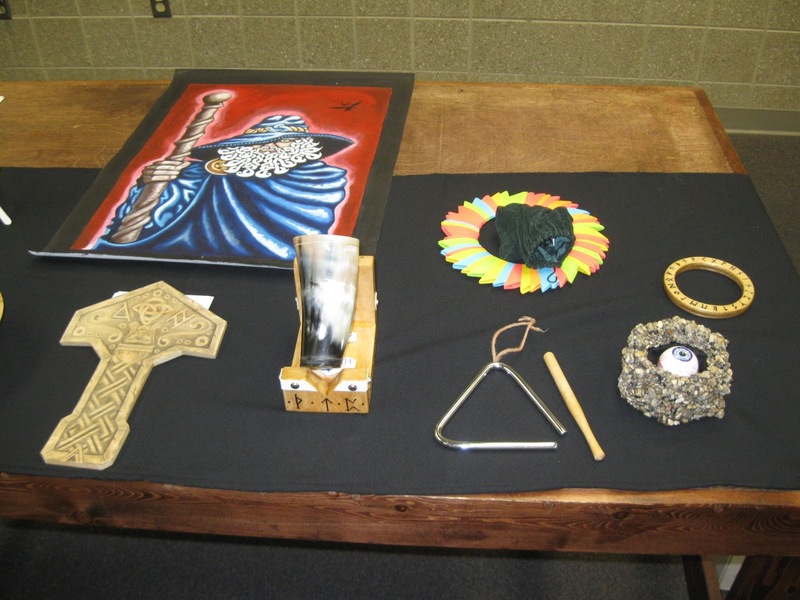 Bottom row; another view of the Thor's hammer, the drinking/toasting horn, a triangle, and a grotesque but religiously symbolic piece of art: Mimir's Well, with the Eye of Odin. The bottom picture is the piece de resistance: the bonfire. 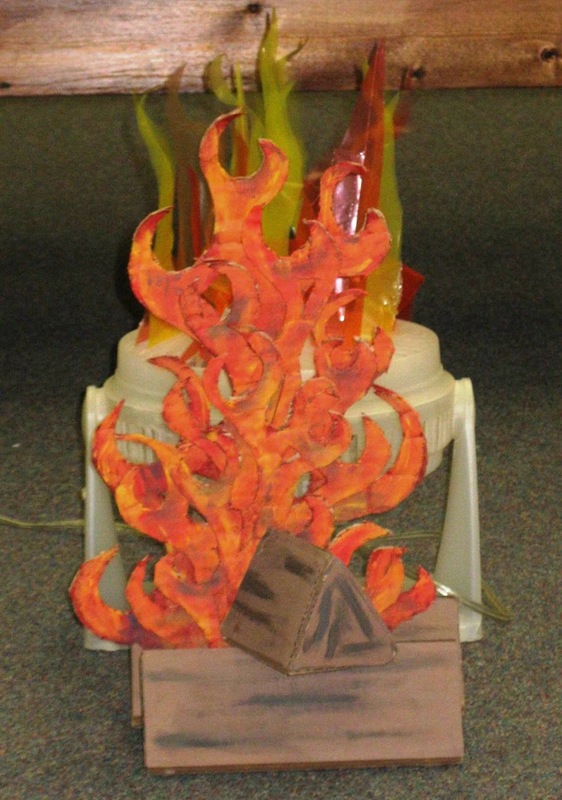 The logs and flames are cardboard; behind them was a fan with red and yellow streamers dancing in the breeze- a startlingly effective illusion. The creativity and focus of the offenders never ceases to amaze me... and make me wonder if they'd be there at all if society had drawn these qualities out earlier.